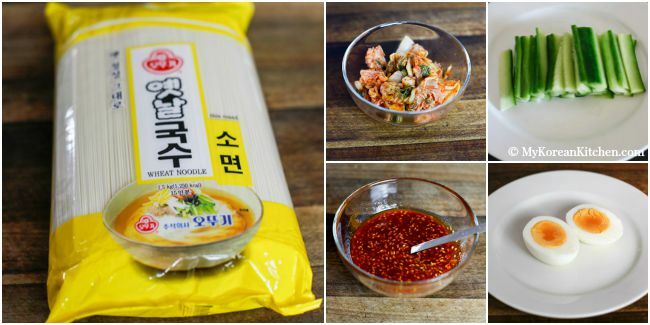 Learn how to make spicy and cold Kimchi noodles! It’s super moreish and addictive! 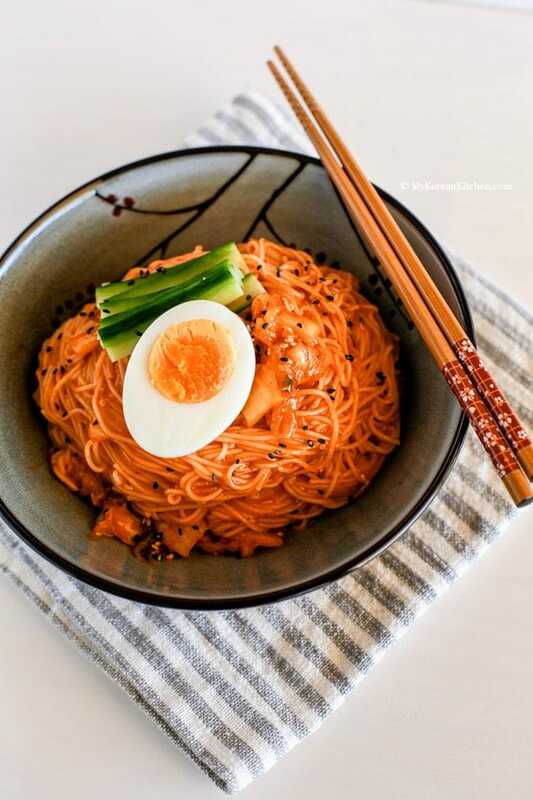 There’s no better way to beat the hot summer weather than having some addictively spicy Korean noodles! Do you agree with me? 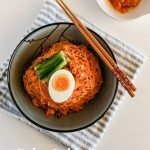 There are many ways you can create spicy Korean noodles (e.g. Cucumber soba noodles, Spicy chewy noodles, Bibim guksu etc.) 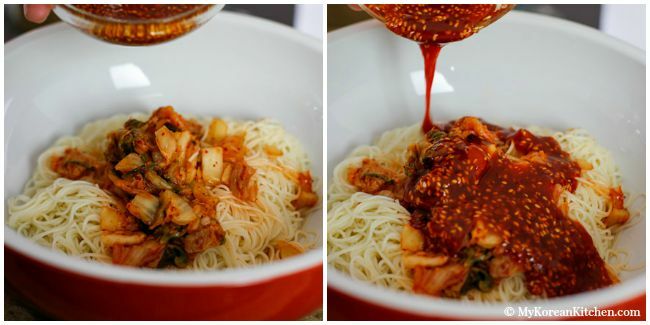 and I think today’s spicy cold kimchi noodles (Kimchi Bibim-guksu, 김치 비빔국수) will become your new favourite as well. 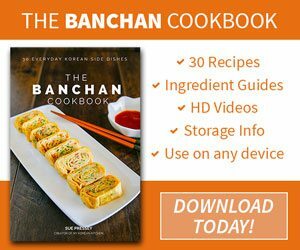 As you can imagine from the title, it’s loaded with Kimchi! (But not too much 🙂 ) More specifically ripened Kimchi – at least 2 to 3 weeks old. If the Kimchi is too fresh, it won’t bring out the desired depth of flavour you need for this. It’s quick and easy to create as well. I hope you enjoy my recipe and give it a try soon! 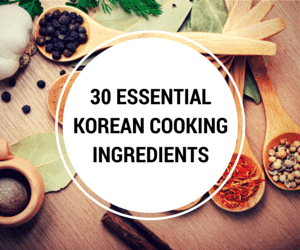 ** If you’re unsure of the above Korean cooking ingredients, find out more about them from my other post “30 Essential Korean cooking ingredients“. 1. Cook the somen noodles in rapidly boiling water until al dente. (Follow the directions from the package.) Drain the noodles and cool down under cold running water for about 1 minute. Stir the noodles with some tongs or your hand while it’s under the water. Drain the noodles well. 2. Put together the noodles, Kimchi (& Kimchi juice if any came out during the cutting) and bibim sauce in a large mixing bowl and mix them well with your hands. (Wear a food handling glove). Serve it in a bowl. Place the cucumber and egg on top of the noodles. Enjoy! 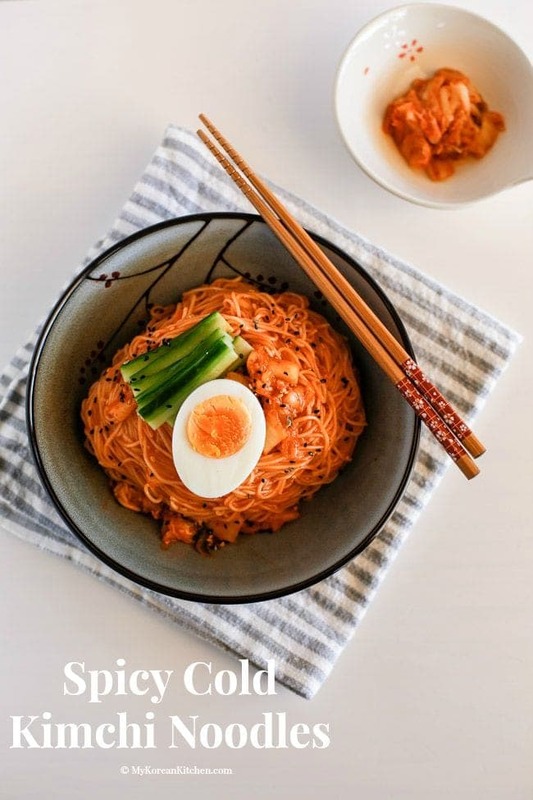 Learn how to make spicy cold kimchi noodles! It's so easy to make and hugely addictive! 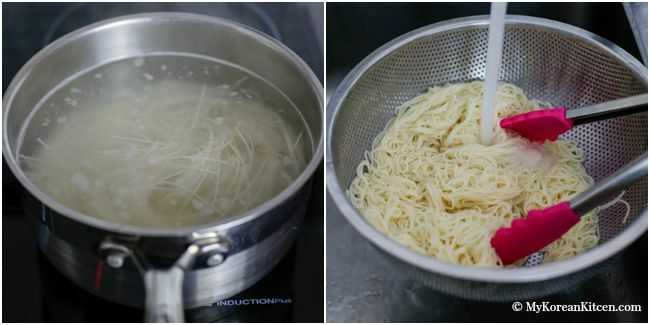 Cook the somen noodles in rapidly boiling water until al dente. (Follow the directions from the package.) Drain the noodles and cool down under cold running water for about 1 minute. Stir the noodles with some tongs or your hand while it’s under the water. Drain the noodles well. Put together the noodles, Kimchi (& Kimchi juice if any came out during the cutting) and bibim sauce in a large mixing bowl and mix them well with your hands. (Wear a food handling glove). Serve it in a bowl. Place the cucumber and egg on top of the noodles. Enjoy! Looks simple and delicious! I was wondering if maybe buckwheat noodles or sweet potato starch noodles would also work with this? Soba noodles are buckwheat, Kelly. I ended up making this with rice noodles and it was delicious! I under-cooked the noodles just a bit so I could use it for meal prep. A couple days later and it’s still amazing! Love the sound of this! Wanted to check if we need to refrigerate this before serving? If you want to serve the noodles really cold, I would suggest you rinse the noodles in icy cold water after boiling it. You can refrigerate the sauce and the boiled egg prior to serve if you want. (Assumed that your Kimchi and cucumber are already kept in the fridge.) Hope this helps! Hi! I’m looking to try this out next week – do you think it would be OK to make ahead the night before to have as lunch the next day, or does it really need to be eaten immediately to avoid going gluggy? I’d suggest for the best outcome, you prepare all ingredients except for noodles the night before, but boil the noodles when you are ready to eat. 🙂 Then mix them all and serve. Thanks for this recipe. It’s easy, quick & super delicious. I’m stuffed. This is SO YUMMY! Definitely going to make this again. ???????????? Is there another noodle I can sub that wouldn’t affect the taste? I have pasta noodles (thin spaghetti) and rice noodles from my Asian parents! Hi Lauren, You could try soba noodles. I wouldn’t recommend rice noodles as it will get gluggy. Angel pasta could work as well. I know this may sound funny coming from a Mexican, but I make Korean food all the time. I love, LOVE Kimchi! You might have just inspired today’s lunch. I have all these ingredients in my frig right now. Can’t wait. Thank you! I love Mexican food too! 🙂 I hope you enjoy this noodles! What a fantastic hot weather recipe! I have only recently discovered how fabulously soothing cold noodles are in the summer (I made the buckwheat ones with Korean sauce several times) and since everything tastes better with kimchi I bet these taste heavenly. so happy to stumble onto your blog! 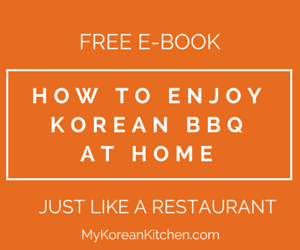 i love korean food and want to have more recipes of authentic origin. thank you for providing these wonderful recipes. my son lives in queensland right now and goes to the uni there so we have been over for a visit! i have converted a few of my kids to korean food. I might make this for him tomorrow, I’m sure he’ll love it.